NYC's most beloved Greek singers join voices to support GREEK AID! 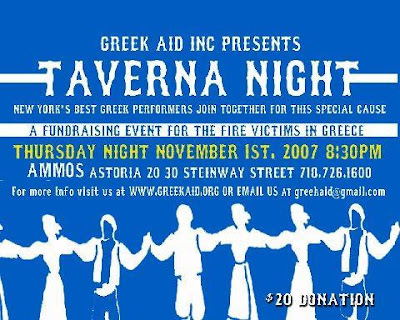 Come eat, sing and dance to raise money for those who need our support to rebuild lives in Greece. $20 donation goes directly to GREEK AID, Inc.
Want to be EXTRA Greek? Trade in some green for colorful carnation trays that you can purchase to shower your fave singers... again, proceeds go to the organization. Parties of six or more are encouraged to make reservations at 718-726-7900.